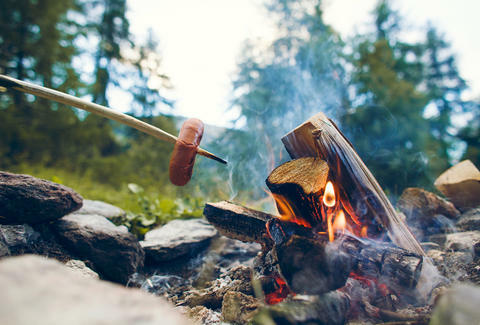 When you think of camping food, there’s s’mores and… survival -- food that isn’t particularly appetizing or “fun.” But sleeping under the stars doesn’t mean you have to give up pizza. We’ve put together three super simple, quick, and hanger-killing recipes for your next camping trip. There are hot dogs. Then there are bacon-wrapped hot dogs on a stick. Roasting over an open flame gives them that great char and extra smoky flavor on the bacon. Super simple and all you need are some wooden sticks. Pro tip: use regular bacon or center cut -- this is probably the one time where thick cut won’t work as well. Take a stick and pierce one end of the bacon, sliding the bacon halfway down. Carefully take a hot dog and push the stick through, from the bottom to top. Go slowly so you don’t make the stick poke out through the side of the hot dog. 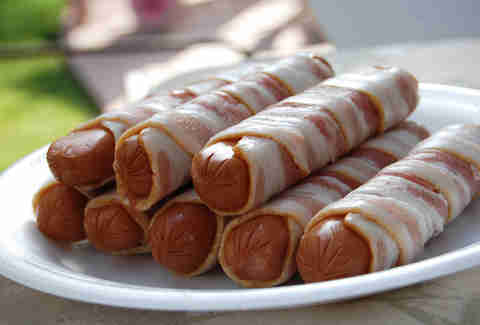 Wrap the bacon around the hot dog in an upward fashion. Secure the end of the bacon on the top of the stick. Place over fire or grill until bacon is cooked and hot dog is charred. Cool dogs down before taking a bite -- bacon burns are too real. English Muffins are a truly underrated breakfast/sandwich vehicle. They’re light, they crisp up perfectly, and they make an even better base for personal pizzas -- it’s all in those nooks and crannies. And who needs a toaster when you have a campfire and a grill rack? Cooks up in no time. Lay the English Muffins on a layer of tin foil. 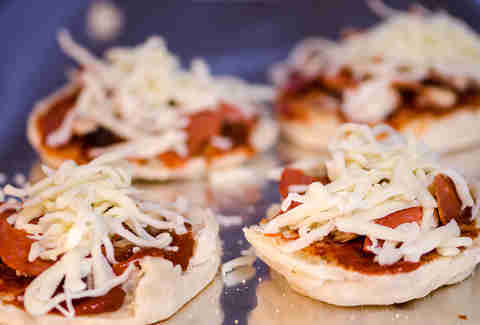 Spread about 1 tbsp of sauce on each English Muffin half. Top with pepperoni or veggies. Place tin foil on a grill rack set over the fire and cook until cheese is melted. If you like to get the bottom more browned, remove tin foil and hold over the fire for a few seconds with tongs. Be careful not to drop in the fire, because that would be sad. 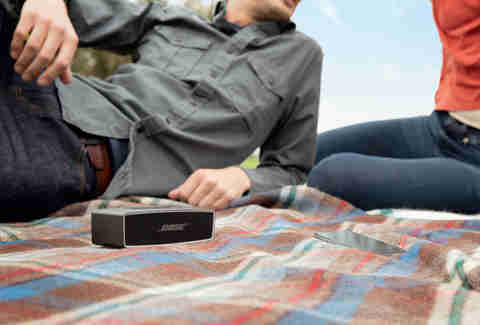 Give your campsite the right vibes with the Bose SoundLink Mini II, portable yet powerful enough to fit every camp cookout. Yes, it’s true. We made fries on a fire. Using thawed out frozen fries, we threw them on some tin foil, set it over that grill rack, and topped with some chili and cheese. Feel free to add more toppings as you see fit, but we wanted to keep things simple. Just like nature. Pro tip: these can be made in one big tin foil packet, or individually sized so everyone gets their own. Take a large sheet of tin foil and layer with another piece of tin foil, cross wise so it looks like a plus sign. Fold in the edges of the tin foil so the sides stick up a little and create a bowl-like shape to hold everything in. Pour the fries out on the tin foil and place on the rack to cook for 7-10 minutes until crisp. 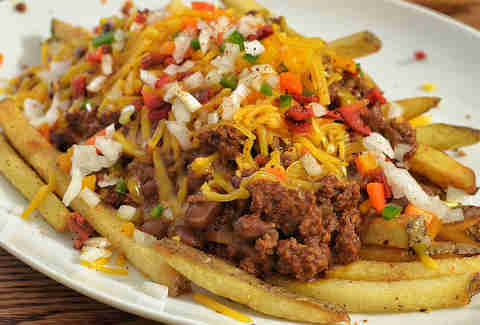 Remove the fries from the rack, add the chili and sprinkle with cheese. Top with a tent of tin foil so it heats and melts the cheese faster. Put the packet back on the grill rack and cook until cheese is melted, another 3-5 minutes. Remove from heat, sprinkle with scallions and/or jalapeños, if you desire.